Trying to get a flat, trim midline is one of the main reasons why many people work out and do abdominal exercises. Although some of those people do lose weight, it’s unlikely that core exercises alone would result in weight loss for most people. Unlike cardiovascular and aerobic exercises, core work doesn’t burn very many calories or dramatically raise the heart rate. Additionally, core and abdominal exercises are designed to tighten and tone muscles, which are more compact but heavier than fat. Choose core exercises that work more muscles than just the abdominals. Perform the plank, bicycle crunches, the bridge and leg lifts. Start out by holding plank and bridge for 30 seconds, 10 bicycle crunches on each side and up to 10 double leg lifts. Instead of going quickly through the exercises, breathe evenly and slowly during each one and concentrate on maintaining proper form throughout the movements. Increase the times you hold each movement, and add repetitions to your routine. As before, focus on holding the proper form, but challenge yourself to move past your previous stopping point. 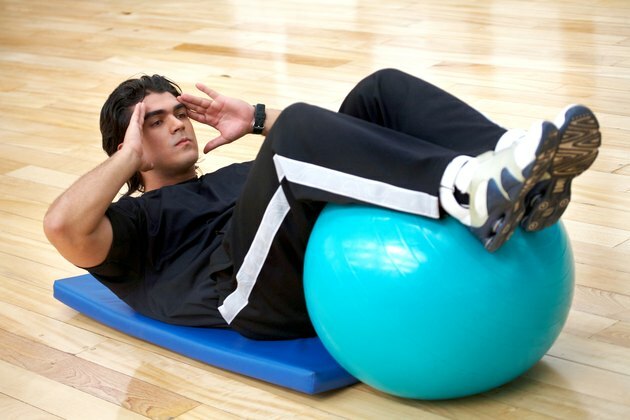 When you can easily perform sets of all the core exercises you’ve chosen, make them more difficult by doing modifications with stability balls. The ball forces the body to focus on balance during each exercise, working core muscles harder and toning muscles faster. Eat a healthy, balanced diet. High-fat and high-cholesterol foods can contribute to both visceral and subcutaneous abdominal fat, and following a healthier diet can help flatten out the midsection. Stick to whole, fresh foods such as fruits, vegetables, whole grains, lean meats, legumes, fish and low-fat or nonfat dairy. Limit saturated fat, added sugar, cholesterol and trans fat. Add aerobic and cardio exercise to your routine, but limit the time and intensity of your sessions. Aerobic exercise is one of the most effective ways to get rid of excess belly fat, but be aware that aerobics burns more calories than core work does. Stick to ACE's recommendations of three to five 30-minute sessions of aerobics per week. To maintain your current weight, stick to light or moderate aerobic activities and don’t reduce the number of calories that you normally eat each day. Focus on balance and stability each time you perform the exercises. Core work actually enhances those abilities and also helps make other exercises easier. Maintaining proper balance and keeping your abdominal muscles tight and stable will make the exercises you do more effective and could help speed up results.